Baltimore (, [ˈbɔɫ.mɔɻ]) is the largest city in the U.S. state of Maryland, and the 29th-most populous city in the country. Baltimore was established by the Constitution of Maryland and is not part of any county. With a population of 621,849 in 2015, Baltimore is the largest independent city in the United States. As of 2016, the population of the Baltimore metropolitan area was estimated to be just under 2.8 million, making it the 21st largest metropolitan area in the country. Baltimore is also part of the Washington-Baltimore combined statistical area (CSA), the fourth largest CSA in the nation with a calculated 2016 population of 9,665,892. 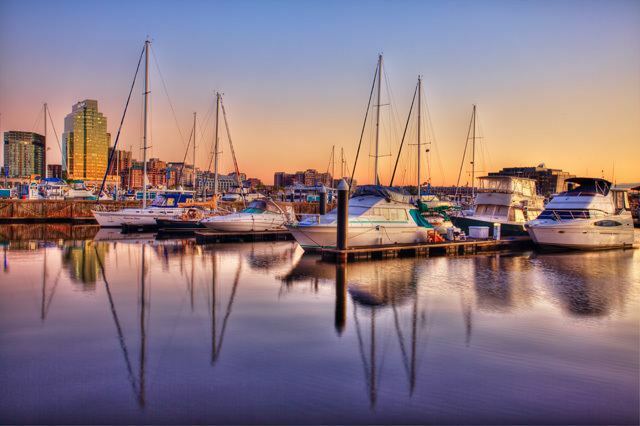 Founded in 1729, Baltimore is the second-largest seaport in the Mid-Atlantic. The city's Inner Harbor was once the second leading port of entry for immigrants to the United States and a major manufacturing center. After a decline in major manufacturing, industrialization, and rail transportation, Baltimore shifted to a service-oriented economy, with Johns Hopkins Hospital (founded 1889) and Johns Hopkins University (founded 1876), now the city's top two employers. With hundreds of identified districts, Baltimore has been dubbed a "city of neighborhoods." Famous residents have included writers Edgar Allan Poe, Edith Hamilton, Frederick Douglass, and H.L. Mencken; jazz musician James "Eubie" Blake; singer Billie Holiday; actor and filmmaker John Waters; and baseball player Babe Ruth. In the War of 1812, Francis Scott Key wrote The Star-Spangled Banner, which later became the American national anthem, in Baltimore. Baltimore has more public statues and monuments per capita than any other city in the country , and is home to some of the earliest National Register Historic Districts in the nation, including Fell's Point, Federal Hill, and Mount Vernon, which were added to the National Register between 1969–1971. Close to a third of the city's buildings (over 65,000) are designated as historic in the National Register, which is more than any other U.S. city. The city has 66 National Register Historic Districts and 33 local historic districts. Over 65,000 properties are designated historic buildings in the National Register of Historic Places listings in Baltimore, more than any other U.S. city. The Baltimore area had been inhabited by Native Americans since at least the 10th millennium BC, when Paleo-Indians first settled in the region. One Paleo-Indian site and several Archaic period and Woodland period archaeological sites have been identified in Baltimore, including four from the Late Woodland period. During the Late Woodland period, the archaeological culture that is called the "Potomac Creek complex" resided in the area from Baltimore to the Rappahannock River in Virginia. In the early 1600s, the immediate Baltimore vicinity was sparsely populated, if at all, by Native Americans. The Baltimore County area northward was used as hunting grounds by the Susquehannocks living in the lower Susquehanna River valley who "controlled all of the upper tributaries of the Chesapeake" but "refrained from much contact with Powhatan in the Potomac region." Pressured by the Susquehannocks, the Piscataway tribe of Algonquians stayed well south of the Baltimore area and inhabited primarily the north bank of the Potomac River in what is now Charles County and southern Prince George's County south of the Fall Line. European colonization of Maryland began with the arrival of an English ship at St. Clement's Island in the Potomac River. Europeans began to settle the area further north, beginning to populate the area of Baltimore County, with its original county seat, known today as "Old Baltimore", located on Bush River within the present-day Aberdeen Proving Ground. The colonists engaged in sporadic warfare with the Susquhanna natives, whose numbers dwindled from casualties and smallpox. In 1661 David Jones claimed the area known today as Jonestown on the east bank of the Jones Falls stream. The colonial General Assembly of Maryland created the Port of Baltimore at old Whetstone Point (now Locust Point) in 1706 for the tobacco trade. The Town of Baltimore, on the west side of the Jones Falls, was founded and laid out on July 30, 1729; with Jonestown and Fells Point preexisting to the east. The three settlements, covering 60 acres, became a commercial hub and in 1768 became the county seat. Baltimore grew swiftly in the 18th century as a granary for sugar-producing colonies in the Caribbean. The profit from sugar encouraged the cultivation of cane and the importation of food. Baltimore established its public market system in 1763. Lexington Market, founded in 1782, continues to be known as one of the oldest continuously operating public markets in the United States today. Lexington Market was also known to be a place for slave trading, which occurred all over the downtown area and was advertised in the Baltimore Sun. Baltimore had the first Post Office System in the United States (inaugurated in 1774) and the first water company chartered in the United States (Baltimore Water Company, 1792). The Town of Baltimore, Jonestown, and Fells Point were incorporated as the City of Baltimore in 1796–1797. The city remained a part of surrounding Baltimore County and continued to serve as its county seat from 1768–1851, after which it became an independent city. The Battle of Baltimore against the British in 1814 inspired the composition of the USA's national anthem, "The Star-Spangled Banner" and the construction of the Battle Monument which became the city's official emblem. A distinctive local culture started to take shape, and a unique skyline peppered with churches and monuments developed. Baltimore acquired its moniker "The Monumental City" after an 1827 visit to Baltimore by President John Quincy Adams. At an evening function Adams gave the following toast: "Baltimore: the Monumental City—May the days of her safety be as prosperous and happy, as the days of her dangers have been trying and triumphant." 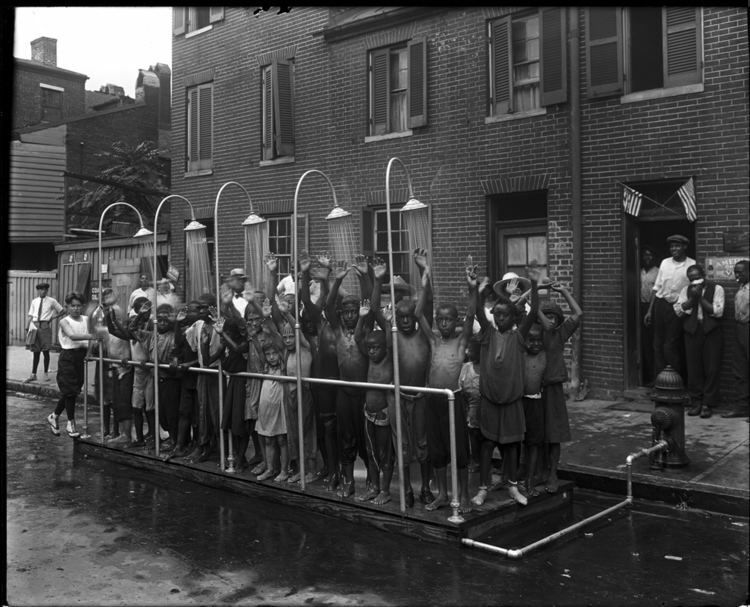 Baltimore pioneered the use of gas lighting in 1816 and its population grew rapidly in the following decades, with concomitant development of culture and infrastructure. The construction of the federally funded National Road (which later became part of U.S. Route 40) and the private Baltimore and Ohio Railroad (B. & O.) made Baltimore a major shipping and manufacturing center by linking the city with major markets in the Midwest. By 1820 its population had reached 60,000, and its economy had shifted from its base in tobacco plantations to sawmilling, shipbuilding, and textile production. These industries benefited from war but successfully shifted into infrastructure development during peacetime. Baltimore suffered one of the worst riots of the antebellum South in 1835, when bad investments led to the Baltimore bank riot. Soon after the city created the world's first dental college, the Baltimore College of Dental Surgery, in 1840, and shared in the world's first telegraph line, between Baltimore and Washington DC in 1844. Maryland, a slave state with abundant popular support for secession in some areas, remained part of the Union during the American Civil War, due in part to the Union's strategic occupation of the city in 1861. Baltimore saw the first casualties of the war on April 19, 1861, when Union Soldiers en route from the President Street Station to Camden Yards clashed with a secessionist mob in the Pratt Street Riot. In the midst of the Long Depression, which followed the Panic of 1873, the Baltimore & Ohio Railroad company attempted to lower its workers' wages, leading to strikes and riots in the city and beyond. Strikers clashed with the National Guard leaving 10 dead and 25 wounded. The city grew in area by annexing new suburbs from the surrounding counties through 1918, when the city acquired portions of Baltimore County and Anne Arundel County. A state constitutional amendment, approved in 1948, required a special vote of the citizens in any proposed annexation area, effectively preventing any future expansion of the city's boundaries. Streetcars enabled the development of distant neighborhoods areas such as Edmonson Village whose residents could easily commute to work downtown. Driven by migration from the deep South and by white suburbanization, the relative size of the city's black population grew from 23.8% in 1950 to 46.4% in 1970. Encouraged by real estate blockbusting techniques, recently settled white areas rapidly became all-black neighborhoods, in a rapid process which was nearly total by 1970. The Baltimore riot of 1968, coinciding with riots in other cities, followed the assassination of Martin Luther King, Jr. on April 4, 1968. Public order was not restored until April 12, 1968. The Baltimore riot cost the city an estimated $10 million (US$ 69 million in 2017). A total of 11,000 Maryland National Guard and federal troops were ordered into the city. Lasting effects of the riot can be seen on the streets of North Avenue, Howard Street, Gay Street, and Pennsylvania Avenue, where long stretches of the streets remain barren. The city experienced challenges again in 1974 when teachers, municipal workers, and police officers conducted strikes. Following the Death of Freddie Gray in April 2015, the city experienced major protests and international media attention, as well as a clash between local youth and police which resulted in a state of emergency declaration and curfew. Baltimore has suffered from a high homicide rate for several decades, peaking in 1993, and again in 2015. These deaths have taken a severe toll especially on the local black community. Baltimore has seen the reopening of the Hippodrome Theatre in 2004, the opening of the Reginald F. Lewis Museum of Maryland African American History & Culture in 2005, and the establishment of the National Slavic Museum in 2012. On April 12, 2012, Johns Hopkins held a dedication ceremony to mark the completion of one of the United States' largest medical complexes – the Johns Hopkins Hospital in Baltimore – which features the Sheikh Zayed Cardiovascular and Critical Care Tower and The Charlotte R. Bloomberg Children's Center. The event, held at the entrance to the $1.1 billion 1.6 million-square-foot-facility, honored the many donors including Sheikh Khalifa bin Zayed Al Nahyan, first president of the United Arab Emirates, and Michael Bloomberg. On September 19, 2016 the Baltimore City Council approved a $660 million bond deal for the $5.5 billion Port Covington redevelopment project championed by Under Armour founder Kevin Plank and his real estate company Sagamore Development. Port Covington surpassed the Harbor Point development as the largest tax-increment financing deal in Baltimore's history and among the largest urban redevelopment projects in the country. The waterfront development that includes the new headquarters for Under Armour, as well as shops, housing, offices, and manufacturing spaces is projected to create 26,500 permanent jobs with a $4.3 billion annual economic impact. The Phoenix Shot Tower (1828), at 234.25 feet (71.40 m) tall, was the tallest building in the United States until the time of the Civil War, and is one of few remaining structures of its kind. It was constructed without the use of exterior scaffolding. The Sun Iron Building, designed by R.C. Hatfield in 1851, was the city's first iron-front building and was a model for a whole generation of downtown buildings. Brown Memorial Presbyterian Church, built in 1870 in memory of financier George Brown, has stained glass windows by Louis Comfort Tiffany and has been called "one of the most significant buildings in this city, a treasure of art and architecture" by Baltimore Magazine. After an international competition, the University of Baltimore School of Law awarded the German firm Behnisch Architekten 1st prize for its design, which was selected for the school's new home. After the building's opening in 2013, the design won additional honors including an ENR National "Best of the Best" Award. North Baltimore lies directly north of Central Baltimore and is bounded on the east by The Alameda and on the west by Pimlico Road. Loyola University Maryland, Johns Hopkins University Homewood Campus, St. Mary's Seminary and University and Notre Dame of Maryland University are located in this district. Baltimore Polytechnic Institute high school for mathematics, science and engineering, and adjacent Western High School, the oldest remaining public girls secondary school in America, share a joint campus at West Cold Spring Lane and Falls Road. The area south of the Vietnam Veterans (Hanover Street) Bridge and the Patapsco River was annexed to the city in 1919 from being independent towns in Anne Arundel County. Across the Hanover Street Bridge are residential areas such as Cherry Hill, Brooklyn, and Curtis Bay, with Fort Armistead bordering the city's south side from Anne Arundel County. Located below Sinclair Lane and Erdman Avenue, above Orleans Street, East Baltimore is mainly made up of residential neighborhoods. This section of East Baltimore is home to Johns Hopkins Hospital and Johns Hopkins University School of Medicine on Broadway. Notable neighborhoods include: Armistead Gardens, Broadway East, Barclay, Ellwood Park, Greenmount, Roland Park and McElderry Park. Northwestern is bounded by the county line to the north and west, Gwynns Falls Parkway on the south and Pimlico Road on the east, is home to Pimlico Race Course, Sinai Hospital, and the headquarters of the NAACP. Its neighborhoods are mostly residential and are dissected by Northern Parkway. The area has been the center of Baltimore's Jewish community since after World War II. Notable neighborhoods include: Pimlico, Mount Washington, and Cheswolde, and Park Heights. Southwest Baltimore is bound by the Baltimore County line to the west, West Baltimore Street to the north, and Martin Luther King Jr. Boulevard and Russell Street/Baltimore-Washington Parkway (Maryland Route 295) to the east. 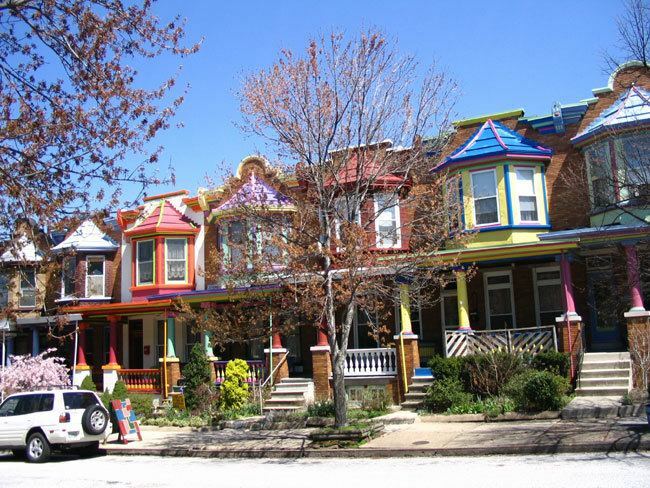 Notable neighborhoods in Southwest Baltimore include: Pigtown, Carrolton Ridge, Ridgely's Delight, Leakin Park, Violetville, Lakeland, and Morrell Park. St. Agnes Hospital on Wilkens and Caton avenues is located in this district with the neighboring Cardinal Gibbons High School, which is the former site of Babe Ruth's alma mater, St. Mary's Industrial School. Also through this segment of Baltimore ran the beginnings of the historic National Road, which was constructed beginning in 1806 along Old Frederick Road and continuing into the county on Frederick Road into Ellicott City, Maryland. Other sides in this district are: Carroll Park, one of the city's largest parks, the colonial Mount Clare Mansion, and Washington Boulevard, which dates to pre-Revolutionary War days as the prime route out of the city to Alexandria, Virginia, and Georgetown on the Potomac River. Extreme temperatures range from −7 °F (−22 °C) on February 9, 1934, and February 10, 1899, up to 108 °F (42 °C) on July 22, 2011. On average, 100 °F (38 °C)+ temperatures occur on 0.9 days annually, 90 °F (32 °C)+ on 37 days, and there are 10 days where the high fails to reach the freezing mark. According to the 2010 Census, there were 620,961 people living in Baltimore City in 242,268 households. The population decreased by 4.6% since the 2000 Census. Among school-age children between 5–17 years old, there was a 23% decline. Baltimore's population has declined at each census since its peak in 1950. According to the 2010 Census, Baltimore's population is 63.7% Black, 29.6% White, 2.3% Asian, and 0.4%, American Indian and Alaska Native. Across races, 4.2% of the population are of Hispanic, Latino, or Spanish origin. Females made up 53.4% of the population. The median age was 35 years old, with 22.4% under 18 years old, 65.8% from 18 to 64 years old, and 11.8% 65 or older. Crime in Baltimore, generally concentrated in areas high in poverty, has been above the national average for many years. Overall reported crime has dropped by 60% from the mid 1990s to the mid 2010s, but homicide rates remain high and exceed the national average. The worst years for crime in Baltimore overall were from 1993–1996; 1995, with 96,243 crimes reported in 1995 (compare with 38,321 in 2014, albeit following a population decline of 100,000). Baltimore's 344 homicides in 2015 represented the highest homicide rate in the city's recorded history—52.5 per 100,000 people, surpassing the record set in 1993—and the second-highest for U.S. cities behind St. Louis and ahead of Detroit. To put that in perspective, New York City, a city with a 2015 population of 8,491,079 recorded a total of 339 homicides in 2015. Baltimore is a city with a 2015 population of 621,849; which means that in 2015 Baltimore had a homicide rate 14 times higher than New York City's. Of Baltimore's 344 homicides in 2015, 321 (93.3%) of the victims were African-American (in a city in which the African-American demographic is 63% of the population). Chicago, which saw 762 homicides in 2016 compared to Baltimore's 318, still had a homicide rate (27.2) that was half of Baltimore's because Chicago has a population 4 times greater than Baltimore's. Drug use and deaths by drug use (particularly drugs used intravenously, such as heroin) are a related problem which has crippled Baltimore for decades. Among cities greater than 400,000, Baltimore ranked 2nd in its opiate drug death rate in the United States behind Dayton, Ohio. The DEA reported that a staggering 10% of Baltimore's population- about 64,000 people- are addicted to heroin. In 2011, Baltimore police reported 196 homicides, the lowest number in the city since a count of 197 homicides in 1978 and far lower than the peak homicide count of 353 slayings in 1993. City leaders at the time credited a sustained focus on repeat violent offenders and increased community engagement for the continued drop, reflecting a nationwide decline in crime. On August 8, 2014, Baltimore's new youth curfew law went into effect. It prohibits unaccompanied children under age 14 from being on the streets after 9 p.m. and those aged 14–16 from being out after 10 p.m. during the week and 11 p.m. on weekends and during the summer. The goal is to keep children out of dangerous places and reduce crime. Crime in Baltimore reached another peak in 2015 when the year's tally of 344 homicides was second only to the record 353 in 1993, when Baltimore had about 100,000 more residents. The killings in 2015 were on pace with recent years in the early months of 2015 but skyrocketed after the unrest and rioting of late April. In five of the next eight months, killings topped 30 or 40 a month. Nearly 90 percent of 2015's homicides were the result of shootings, renewing calls for new gun laws. Counting nonfatal shootings, gun violence was up more than 75 percent compared to 2014, with more than 900 people shot. In 2016, according to annual crime statistics released by the Baltimore Police Department, there were 318 murders in the city. This total marked a 7.56 percent decline in homicides from 2015. Once a predominantly industrial town, with an economic base focused on steel processing, shipping, auto manufacturing (General Motors Baltimore Assembly), and transportation, the city experienced deindustrialization which cost residents tens of thousands of low-skill, high-wage jobs. The city now relies on a low-wage service economy, which accounts for 31% of jobs in the city. Around the turn of the century, Baltimore was the leading US manufacturer of rye whiskey and straw hats. It also led in refining of crude oil, brought to the city by pipeline from Pennsylvania. As of March 2015 the U.S. Bureau of Labor Statistics calculates Baltimore's unemployment rate at 8.1% while one quarter of Baltimore residents (and 37% of Baltimore children) live in poverty. The 2012 closure of a major steel plant at Sparrows Point is expected to have a further impact on employment and the local economy. The Census Bureau reported in 2013 that 207,000 workers commute into Baltimore city each day. Downtown Baltimore is the primary economic asset within Baltimore City and the region with 29.1 million square feet of office space. The tech sector is rapidly growing as the Baltimore metro ranks 8th in the CBRE Tech Talent Report among 50 U.S. metro areas for high growth rate and number of tech professionals. Forbes ranked Baltimore fourth among America's "new tech hot spots". The city is home to the Johns Hopkins Hospital. Other large companies in Baltimore include Under Armour, Cordish Company, Legg Mason, McCormick & Company, T. Rowe Price, and Royal Farms. A sugar refinery owned by American Sugar Refining is one of Baltimore's cultural icons. Nonprofits based in Baltimore include Lutheran Services in America and Catholic Relief Services. Almost a quarter of the jobs in the Baltimore region were in science, technology, engineering and math as of mid 2013, in part attributed to the city's extensive undergraduate and graduate schools; maintenance and repair experts were included in this count. The center of international commerce for the region is the World Trade Center Baltimore. It houses the Maryland Port Administration and U.S. headquarters for major shipping lines. Baltimore is ranked 9th for total dollar value of cargo and 13th for cargo tonnage for all U.S. ports. In 2014, total cargo moving through the port totaled 29.5 million tons, down from 30.3 million tons in 2013. The value of cargo traveling through the port in 2014 came to $52.5 billion, down from $52.6 billion in 2013. The Port of Baltimore generates $3 billion in annual wages and salary, as well as supporting 14,630 direct jobs and 108,000 jobs connected to port work. In 2014, the port also generated more than $300 million in taxes. It serves over 50 ocean carriers making nearly 1,800 annual visits. Among all U.S. ports, Baltimore is first in handling automobiles, light trucks, farm and construction machinery; and imported forest products, aluminum, and sugar. The port is second in coal exports. The Port of Baltimore's cruise industry, which offers year-round trips on several lines supports over 500 jobs and brings in over $90 million to Maryland's economy annually. Growth at the port continues with the Maryland Port Administration plans to turn the southern tip of the former steel mill into a marine terminal, primarily for car and truck shipments, but also for anticipated new business coming to Baltimore after the completion of the Panama Canal expansion project. 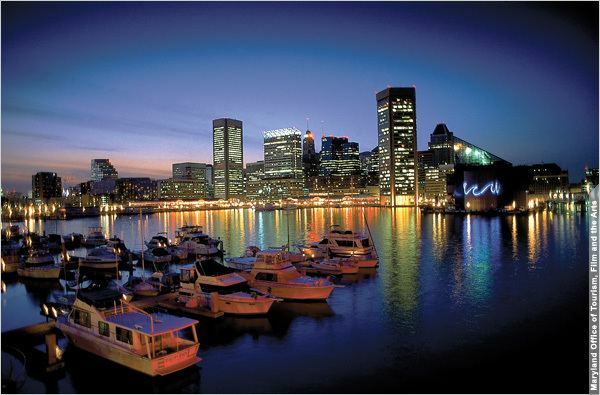 Baltimore's history and attractions have allowed the city to become a strong tourist destination on the East Coast. In 2014, the city hosted 24.5 million visitors, who spent $5.2 billion. The Baltimore Visitor Center, which is operated by Visit Baltimore, is located on Light Street in the Inner Harbor. Much of the city's tourism centers around the Inner Harbor, with the National Aquarium being Maryland's top tourist destination. Baltimore Harbor's restoration has made it "a city of boats", with several historic ships and other attractions on display and open for the public to visit. The USS Constellation, the last Civil War-era vessel afloat, is docked at the head of the Inner Harbor; the USS Torsk, a submarine that holds the Navy's record for dives (more than 10,000); and the Coast Guard cutter Taney, the last surviving U.S. warship that was in Pearl Harbor during the Japanese attack on December 7, 1941, and which engaged Japanese Zero aircraft during the battle. Also docked is the lightship Chesapeake, which for decades marked the entrance to Chesapeake Bay; and the Seven Foot Knoll Lighthouse, the oldest surviving screw-pile lighthouse on Chesapeake Bay, which once marked the mouth of the Patapsco River and the entrance to Baltimore. All of these attractions are owned and maintained by the Historic Ships in Baltimore organization. The Inner Harbor also is the home port of Pride of Baltimore II, the state of Maryland's "goodwill ambassador" ship, a reconstruction of a famous Baltimore Clipper ship. Other popular tourist destinations throughout the city include Oriole Park at Camden Yards, Fort McHenry, the Mount Vernon and Fells Point neighborhoods, and museums such as the Walters Art Museum, the Baltimore Museum of Industry, and the B&O Railroad Museum. Baltimore, and more specifically, the Baltimore Convention Center is home to BronyCon, the world's largest convention for fans of My Little Pony: Friendship is Magic. The convention had over 6,300 attendees in 2017, and 10,011 attendees during its peak in 2015. Each year the Artscape takes place in the city in the Bolton Hill neighborhood, due to its proximity to Maryland Institute College of Art. Artscape styles itself as the "largest free arts festival in America". Each May, the Maryland Film Festival takes place in Baltimore, using all five screens of the historic Charles Theatre as its anchor venue. Many movies and television shows have been filmed in Baltimore. The Wire was set and filmed in Baltimore. House of Cards and Veep are set in Washington, D.C. but filmed in Baltimore. Baltimore has a long and storied baseball history, including its distinction as the birthplace of Babe Ruth in 1895. The original 19th century Baltimore Orioles were one of the most successful early franchises, featuring numerous hall of famers during its years from 1882 to 1899. As one of the eight inaugural American League franchises, the Baltimore Orioles played in the AL during the 1901 and 1902 seasons. The team moved to New York City before the 1903 season and was renamed the New York Highlanders, which later became the New York Yankees. Ruth played for the minor league Baltimore Orioles team, which was active from 1903 to 1914. After playing one season in 1915 as the Richmond Climbers, the team returned the following year to Baltimore, where it played as the Orioles until 1953. The team currently known as the Baltimore Orioles has represented Major League Baseball locally since 1954 when the St. Louis Browns moved to the city of Baltimore. The Orioles advanced to the World Series in 1966, 1969, 1970, 1971, 1979 and 1983, winning three times (1966, 1970 and 1983), while making the playoffs all but one year (1972) from 1969 through 1974. In 1995, local player (and later Hall of Famer) Cal Ripken, Jr. broke Lou Gehrig's streak of 2,130 consecutive games played, for which Ripken was named Sportsman of the Year by Sports Illustrated magazine. Six former Orioles players, including Ripken (2007), and two of the team's managers have been inducted into the Baseball Hall of Fame. Prior to an NFL team moving to Baltimore, there had been several attempts at a professional football team prior to the 1950s. Most were minor league or semi-professional teams. The first major league to base a team in Baltimore was the All-America Football Conference (AAFC), which had a team named the Baltimore Colts. The AAFC Colts played for three seasons in the AAFC (1947, 1948, and 1949), and when the AAFC folded following the 1949 season, moved to the NFL for a single year (1950) before going bankrupt. Three years later, the NFL's Dallas Texans would itself fold, and its assets and player contracts purchased by an ownership team headed by Baltimore businessman Carroll Rosenbloom, who moved the team to Baltimore, establishing a new team also named the Baltimore Colts. During the 1950s and 1960s, the Colts were one of the NFLs more successful franchises, led by NFL Hall of Fame quarterback Johnny Unitas who set a then-record of 47 consecutive games with a touchdown pass. The Colts advanced to the NFL Championship twice (1958 & 1959) and Super Bowl twice (1969 & 1971), winning all except Super Bowl III in 1969. After the 1983 season, the team left Baltimore for Indianapolis in 1984, where it became the Indianapolis Colts. The NFL returned to Baltimore when the former Cleveland Browns moved to Baltimore to become the Baltimore Ravens in 1996. Since then, the Ravens won a Super Bowl championship in 2000 and 2012, four AFC North division championships (2003, 2006, 2011 and 2012), and appeared in four AFC Championship Games (2000, 2008, 2011 and 2012). The first professional sports organization in the United States, The Maryland Jockey Club, was formed in Baltimore in 1743. Preakness Stakes, the second race in the United States Triple Crown of Thoroughbred Racing, has been held every May at Pimlico Race Course in Baltimore since 1873. College lacrosse is a popular sport in the spring, as the Johns Hopkins Blue Jays men's lacrosse team has won 44 national championships, the most of any program in history. In addition, Loyola University won its first men's NCAA lacrosse championship in 2012. The Baltimore Blast are a professional arena soccer team that play in the Major Arena Soccer League at the Royal Farms Arena. The Blast have won 8 championships in various leagues, including the MASL. A previous entity of the Blast played in the Major Indoor Soccer League from 1980 to 1992, winning 1 championship. The Baltimore Blues are a semi-professional rugby league club which began competition in the USA Rugby League in 2012. The Baltimore Bohemians are an American soccer club. They compete in the USL Premier Development League, the fourth tier of the American Soccer Pyramid. Their inaugural season started in the spring of 2012. The Baltimore Grand Prix debuted along the streets of the Inner Harbor section of the city's downtown on September 2–4, 2011. The event played host to the American Le Mans Series on Saturday and the IndyCar Series on Sunday. Support races from smaller series were also held, including Indy Lights. After three consecutive years, on September 13, 2013, it was announced that the event would not be held in 2014 or 2015 due to scheduling conflicts. The athletic equipment company, Under Armour is also based out of Baltimore. Founded in 1996 by Kevin Plank, a University of Maryland alumnus, the company's headquarters are located in Tide Point, adjacent to Fort McHenry and the Domino Sugar factory. The Baltimore Marathon is the flagship race of several races. The marathon begins at the Camden Yards sports complex and travels through many diverse neighborhoods of Baltimore, including the scenic Inner Harbor waterfront area, historic Federal Hill, Fells Point, and Canton, Baltimore. The race then proceeds to other important focal points of the city such as Patterson Park, Clifton Park, Lake Montebello, the Charles Village neighborhood and the western edge of downtown. After winding through 42.195 kilometres (26.219 mi) of Baltimore, the race ends at virtually the same point at which it starts. The City of Baltimore boasts over 4,900 acres (1,983 ha) of parkland. The Baltimore City Department of Recreation and Parks manages the majority of parks and recreational facilities in the city including Patterson Park, Federal Hill Park, and Druid Hill Park. The city is also home to Fort McHenry National Monument and Historic Shrine, a coastal star-shaped fort best known for its role in the War of 1812. As of 2015, The Trust for Public Land, a national land conservation organization, ranks Baltimore 40th among the 75 largest U.S. cities. Baltimore is an independent city, and not part of any county. For most governmental purposes under Maryland law, Baltimore City is treated as a county-level entity. The United States Census Bureau uses counties as the basic unit for presentation of statistical information in the United States, and treats Baltimore as a county equivalent for those purposes. Baltimore has been a Democratic stronghold for over 150 years, with Democrats dominating every level of government. In virtually all elections, the Democratic primary is the real contest. No Republican has won election to the city council since 1939, and no Republican has won the mayor's race since 1963. The city hosted the first six Democratic National Conventions, from 1832 through 1852, and hosted the DNC again in 1860, 1872, and 1912. For a full list of mayors, see List of Baltimore Mayors. Sheila Dixon became the first female mayor of Baltimore on January 17, 2007. As the former City Council President, she assumed the office of Mayor when former Mayor Martin O'Malley took office as Governor of Maryland. On November 6, 2007, Dixon won the Baltimore mayoral election. Mayor Dixon's administration ended less than three years after her election, the result of a criminal investigation that began in 2006 while she was still City Council President. She was convicted on a single misdemeanor charge of embezzlement on December 1, 2009. A month later, Dixon made an Alford plea to a perjury charge and agreed to resign from office; Maryland, like most states, does not allow convicted felons to hold office. Stephanie Rawlings-Blake, who was City Council President at that time, assumed the office of Mayor on February 4, 2010, when Dixon's resignation became effective. She was elected to a full term in 2011, receiving 84% of the vote. Catherine Pugh, who had lost in a primary contest with Rawlings-Blake in 2011, became the Democratic nominee for 2016 and won the mayoral election in 2016 with 57.1% of the vote; Pugh took office as mayor on December 6, 2016. Grassroots pressure for reform, voiced as Question P, restructured the city council in November 2002, against the will of the mayor, the council president, and the majority of the council. A coalition of union and community groups, organized by the Association of Community Organizations for Reform Now (ACORN), backed the effort. The Baltimore City Council is now made up of 14 single-member districts and one elected at-large council president. Bernard C. "Jack" Young has been the council president since February 2010, when he was unanimously elected by the other council members to replace Stephanie Rawlings-Blake, who had become mayor. Edward Reisinger, the 10th district representative, is the council's current vice president. The Baltimore City Police Department, founded 1784 as a "Night City Watch" and day Constables system and later reorganized as a City Department in 1853, with a following reorganization under State of Maryland supervision in 1859, with appointments made by the Governor of Maryland after a disturbing period of civic and elections violence with riots in the later part of the decade, is the current primary law enforcement agency serving the citizens of the City of Baltimore. Campus and building security for the city's public schools is provided by the Baltimore City Public Schools Police, established in the 1970s. The Maryland Transportation Authority Police under the Maryland Department of Transportation, (originally established as the Baltimore Harbor Tunnel Police" when opened in 1957) is the primary law enforcement agency on the Fort McHenry Tunnel Thruway (Interstate 95), the Baltimore Harbor Tunnel Thruway (Interstate 895), which go under the Northwest Branch of the Patapsco River, and Interstate 395, which has three ramp bridges crossing the Middle Branch of the Patapsco River which are under MdTA jurisdiction, the Baltimore-Washington International Airport, (BWI) and have limited concurrent jurisdiction with the Baltimore City Police Department under a "memorandum of understanding". Law enforcement on the fleet of transit buses and transit rail systems serving Baltimore is the responsibility of the Maryland Transit Administration Police, which is part of the Maryland Transit Administration of the state Department of Transportation. The MTA Police also share jurisdiction authority with the Baltimore City Police, governed by a memorandum of understanding. As the enforcement arm of the Baltimore circuit and district court system, the Baltimore City Sheriff's Office, created by state constitutional amendment in 1844, is responsible for the security of city courthouses and property, service of court-ordered writs, protective and peace orders, warrants, tax levies, prisoner transportation and traffic enforcement. Deputy Sheriffs are sworn law enforcement officials, with full arrest authority granted by the constitution of Maryland, the Maryland Police and Correctional Training Commission and the Sheriff of the City of Baltimore. The United States Coast Guard, operating out of their shipyard and facility (since 1899) at Arundel Cove on Curtis Creek, (off Pennington Avenue extending to Hawkins Point Road/Fort Smallwood Road) in the Curtis Bay section of southern Baltimore City and adjacent northern Anne Arundel County. The U.S.C.G. also operates and maintains a presence on Baltimore and Maryland waterways in the Patapsco River and Chesapeake Bay. "Sector Baltimore" is responsible for commanding law enforcement and search & rescue units as well as aids to navigation. The city of Baltimore is protected by the over 1,800 professional firefighters of the Baltimore City Fire Department (BCFD), which was founded in December 1858 and began operating the following year. Replacing several warring independent volunteer companies since the 1770s and the confusion resulting from a riot involving the "Know-Nothing" political party two years before, the establishment of a unified professional fire fighting force was a major advance in urban governance. The BCFD operates out of 37 fire stations located throughout the city and has a long history and sets of traditions in its various houses and divisions. Since the legislative redistricting in 2002, Baltimore has had six legislative districts located entirely within its boundaries, giving the city six seats in the 47-member Maryland Senate and 18 in the 141-member Maryland House of Delegates. During the previous 10-year period, Baltimore had four legislative districts within the city limits, but four others overlapped the Baltimore County line. As of January 2011, all of Baltimore's state senators and delegates were Democrats. Approval of the next redistricting plan is expected to become effective in time for Maryland's 2012 congressional primary election on February 14, 2012. Three of the state's eight congressional districts include portions of Baltimore: the 2nd, represented by Dutch Ruppersberger; the 3rd, represented by John Sarbanes; and the 7th, represented by Elijah Cummings. All three are Democrats; a Republican has not represented a significant portion of Baltimore in Congress since John Boynton Philip Clayton Hill represented the 3rd District in 1927, and has not represented any of Baltimore since the Eastern Shore-based 1st District lost its share of Baltimore after the 2000 census; it was represented by Republican Wayne Gilchrest at the time. Maryland's senior Senator, Ben Cardin, is from Baltimore. He is one of three people in the last four decades to have represented the 3rd District before being elected to the Senate. Paul Sarbanes represented the 3rd from 1971 until 1977, when he was elected to the first of five terms in the Senate. Sarbanes was succeeded by Barbara Mikulski, who represented the 3rd from 1977 to 1987. Mikulski was succeeded by Cardin, who held the seat until handing it to John Sarbanes upon his election to the Senate in 2007. The Postal Service's Baltimore Main Post Office is located at 900 East Fayette Street in the Jonestown area. The national headquarters for the United States Social Security Administration is located in Woodlawn, just outside of Baltimore. The city's public schools are managed by Baltimore City Public Schools and include schools that have been well known in the area: Carver Vocational-Technical High School, the first African American vocational high school and center that was established in the state of Maryland; Digital Harbor High School, one of the secondary schools that emphasizes information technology; Lake Clifton Eastern High School, which is the largest school campus in Baltimore City of physical size; the historic Frederick Douglass High School, which is the second oldest African American high school in the United States; Baltimore City College, the third oldest public high school in the country; and Western High School, the oldest public all-girls school in the nation. Baltimore City College (also known as "City") and Baltimore Polytechnic Institute (also known as "Poly") share the nation's second-oldest high school football rivalry. In June 2017, The BaltimoreLink started operating; it is the redesign of the region's initial bus system. The BaltimoreLink runs through downtown Baltimore every 10 minutes via color-coded, high-frequency CityLink routes. Baltimore's Inner Harbor, known for its skyline waterscape and its tourist-friendly areas, was horribly polluted. The waterway was often filled with garbage after heavy rainstorms, failing its 2014 water quality report card. The Waterfront Partnership of Baltimore took steps to remediate the waterways, in hopes that the harbor would be fishable and swimmable once again. Installed in May 2014, the water wheel trash interceptor known as Mr. Trash Wheel sits at the mouth of the Jones Falls River in Baltimore's Inner Harbor. A February 2015 agreement with a local waste-to-energy plant is believed to make Baltimore the first city to use reclaimed waterway debris to generate electricity. Mr. Trash Wheel is the world's first permanent water wheel trash interceptor to clean up the city's polluted Inner Harbor. The Jones Falls river watershed drains fifty-eight square miles of land outside of Baltimore and is a significant source of trash that enters the harbor. Garbage collected by Mr. Trash Wheel could come from anywhere in the Jones Falls Watershed area. The wheel moves continuously, removing garbage and dumping it into an attached dumpster using only hydro and solar renewable power to keep its wheel turning. It has the capability to collect 50,000 pounds of trash per day, and has removed more than 350 tons of litter from Baltimore's landmark and tourist attraction in its first 18 months, estimated as consisting of approximately 200,000 bottles, 173,000 potato chip bags and 6.7 million cigarettes butts. The Water Wheel has been very successful at trash removal, visibly decreasing the amount of garbage that collects in the harbor, especially after a rainfall. After the success of Mr. Trash Wheel, the Waterfront Partnership raised money to build a second Water Wheel at the end of Harris Creek, an entirely piped stream that flows beneath Baltimore's Canton neighborhood and empties into the Baltimore Harbor. Harris Creek is known to carry tons of trash every year. The planned new Water Wheel was inaugurated in December 2016, and dubbed "Professor Trash Wheel". Professor Trash Wheel prevents waste from exiting the Harbor and accessing the Chesapeake Bay and Atlantic Ocean. A number of additional projects are going on in Baltimore City and County that should result in better water quality scores. These projects include the Blue Alleys project, expanded street sweeping, and stream restoration. In August 2010, the National Aquarium assembled, planted, and launched a floating wetland island designed by Biohabitats in Baltimore's Inner Harbor. Hundreds of years ago Baltimore's harbor shoreline would have been lined with tidal wetlands. Floating wetlands provide many environmental benefits to water quality and habitat enhancement, which is why the Waterfront Partnership of Baltimore has included them in their Healthy Harbor Initiative pilot projects. Biohabitats also developed a concept to transform a dilapidated wharf into a living pier that cleans Harbor water, provides habitat and is an aesthetic attraction. Currently under design, the top of the pier will become a constructed tidal wetland. Baltimore's main newspaper is The Baltimore Sun. It was sold by its Baltimore owners in 1986 to the Times Mirror Company, which was bought by the Tribune Company in 2000. The Baltimore News-American, another long-running paper that competed with the Sun, ceased publication in 1986. The city is home to the Baltimore Afro-American, an influential African American newspaper founded in 1892. In 2006, The Baltimore Examiner was launched to compete with The Sun. It was part of a national chain that includes The San Francisco Examiner and The Washington Examiner. In contrast to the paid subscription Sun, The Examiner was a free newspaper funded solely by advertisements. Unable to turn a profit and facing a deep recession, The Baltimore Examiner ceased publication on February 15, 2009. Despite being located 40 miles northeast of Washington, D.C., Baltimore is a major media market in its own right, with all major English language television networks represented in the city. WJZ-TV is a CBS owned and operated station, and WBFF is the flagship of Sinclair Broadcast Group, the largest station owner in the country. Nielsen ranked Baltimore as the 26th-largest television market for the 2008–2009 viewing season and the 27th-largest for 2009–2010. Arbitron's Fall 2010 rankings identified Baltimore as the 22nd largest radio market.